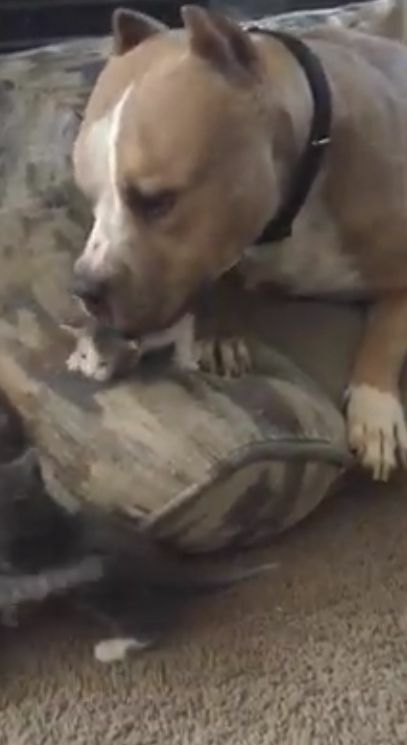 Some animals just adore other animals. They're special pets and often tend to raise, comfort and support other animals if given the chance. 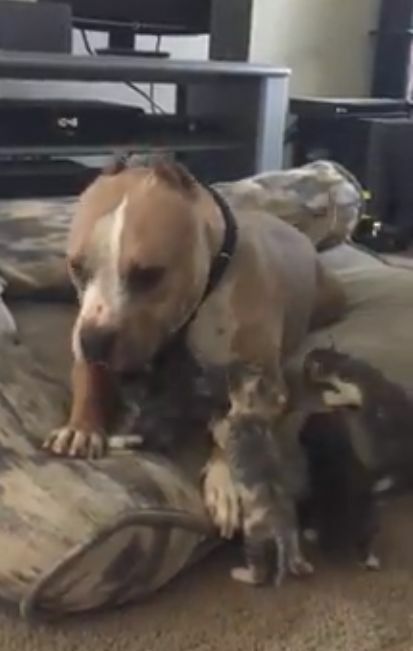 One family recently discovered that their dog was more than happy to act as mom to a new litter of kittens. 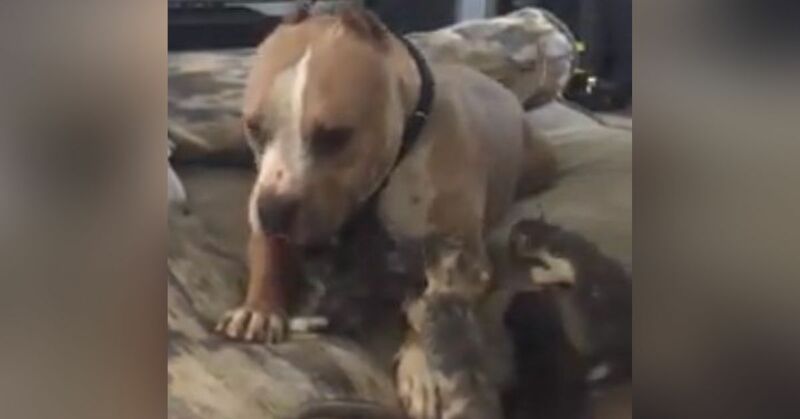 Ozzy the pit bull has always loved cats. When his family adopted him three years ago, Ozzy was delighted to find he had a new cat brother, Norm. Unfortunately, Norm wasn't as enthralled with Ozzy as Ozzy was with the cat, and Norm told Ozzy to stay away. But Ozzy didn't give up on finding love. He developed a great bond with the family's 5-year-old son, and the two are now best friends. Ozzy also demonstrated his love of feet, licking bare feet enthusiastically. Ozzy also loves babies and other people. In fact, he's so friendly that his mom, Jennifer Lajeniss, jokes that he'd happily help robbers break in and even hold their flashlight for them. Ozzy is a super sweet soul. Though Ozzy has a human family that adores him, his love of cats has never waned. When Lajeniss took in Winnie, a pregnant stray cat, Ozzy finally got the feline family he so wanted. Winnie gave birth to five kittens, and Ozzy has showered them with attention ever since. Ozzy is incredibly attentive to the kittens. If they cry, he'll race over to check on and comfort them. 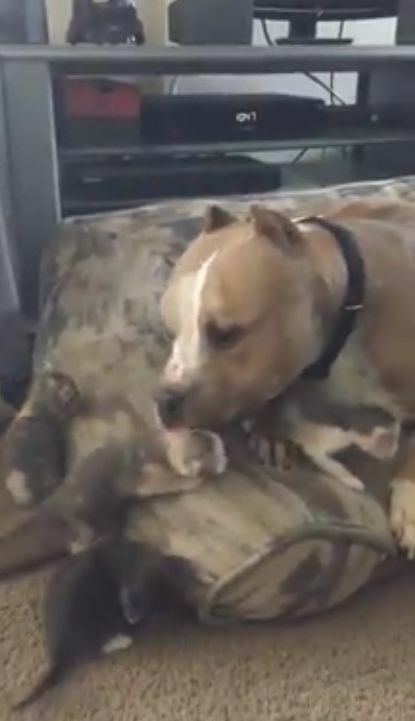 When he's interacting with the kittens, he never stops wagging his tail. Luckily for Ozzy, the feeling is mutual and the kittens adore him, too. They crawl all over the delighted dog who licks them and wags his tail enthusiastically. Even Winnie likes Ozzy and probably appreciates the break in caring for her kittens. As the kittens age and are ready to be adopted, four of them will be offered up to adoptive homes, but there's good news for Ozzy. Winnie and one of her kittens will remain with the family so he will still have two cats to care for.